Group photo of Samuel Jackson DeWitt and Ida Shellhorn DeWitt taken on their 45th wedding anniversary at their home on 4th St., Salina, KS. Information provided by Myra DeWitt, Gertrude DeWitt Small, and Jane DeWitt Smith, daughters of Lyle B and Hazel Smith DeWitt. 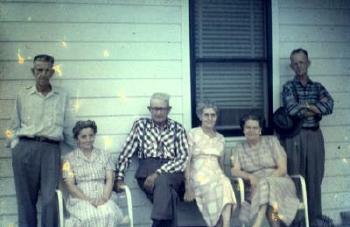 Back row: Lloyd DeWitt, oldest child of Ira and Katie; Merle DeWitt, Florence DeWitt Stites, Clyde DeWitt, Bertha DeWitt Webster, Bertha’s husband “Bud” Warren Myron Webster; Katie Grubb (Mrs. Ira) DeWitt; Ira DeWitt. 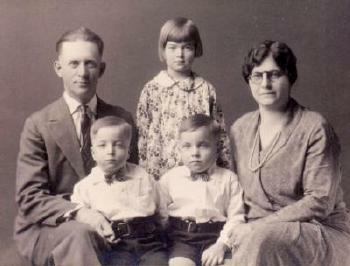 Middle Row: Oren Webster, oldest child of Bertha and “Bud” DeWitt; Russell DeWitt, 2nd child of Ira and Katie; “Babe” Fayette Weaver holding one of their twins, either Keith or Kenneth, and Mary Elizabeth “ Marie” Weaver holding the other twin. Keith and Kenneth’s date of birth is 10 July1925. Blanche Beatrice Parks DeWitt (Mrs. Clyde) holding son Dale. 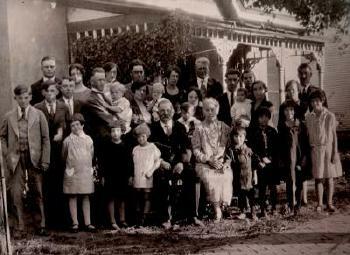 Lyle DeWitt (Just above his mother’s left shoulder); Lyle’s wife Hazel Smith DeWitt holding their 4th child, Jane, whose birthday is Nov 14, 1926. 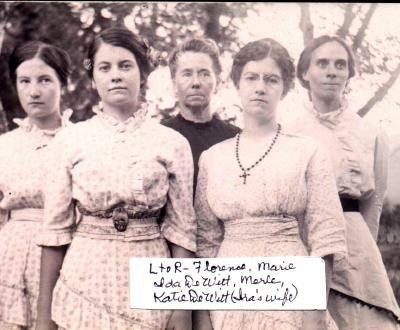 On Hazel’s left is Evangeline DeWitt (3rd child of Ira and Katie DeWitt). Front Row: Gordon Webster, 2nd child of Bertha and “Bud” Webster; Lola Lee Stites, only child of Florence DeWitt Stites; Mary Ellen DeWitt (4th child of Ira and Katie);Gwen Weaver, oldest child of “Babe” and “Marie” Weaver ; Samuel J DeWitt, Ida DeWitt, Gertrude DeWitt (3rd child of Lyle and Hazel DeWitt); Myra DeWitt (2nd child of Lyle and Hazel) and Marian DeWitt, oldest daughter of Lyle and Hazel. 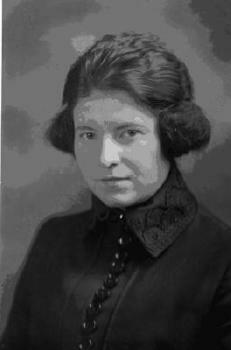 At the end of the row, Ida Fay Webster, 3rd child of Bertha and “Bud”. 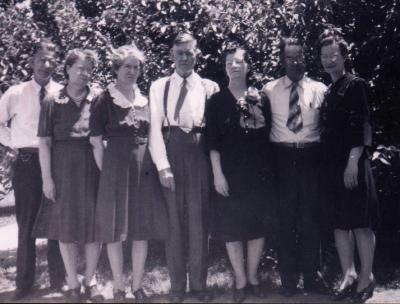 [S175] Sharon Shellhorn Phelps, Descendants of Barnet DeWitt, online www.familytreemaker.com/users/p/h/e/sharon-s-phelps/index.html. [S590] Obituary, DeWitt, Samuel J., May 28, 1942, page 3, column 5. [S924] 1920 U. S. Census, Kansas, Dickinson County, Chapman, ED 50, sheet 12A/264, line 40, 184 Logan Avenue, dwelling 184, family 184, Kansas, Dickinson County. [S1543] Barbara Hettinger, "Re: Your Website (Group photo of Samuel Jackson DeWitt and Ida Shellhorn DeWitt)," e-mail to Julia Langel, September 9, 2004, Re: Your Website (Group photo of Samuel Jackson DeWitt and Ida Shellhorn DeWitt). [S765] The Salina Journal, June 15, 1944, page 12, column 4. [S1234] 1930 U. S. Census, Missouri, Shelby County, Salt River Township, ED 13, sheet 7B, line 86, dwelling 175, family 177, Missouri, Shelby County. [S1543] Barbara Hettinger, "One More Family," e-mail to Julia Langel, March 30, 2009, One More Family. [S1737] 1900 U. S. Census, Nebraska, Pawnee County, West Branch, ED 128, page 9A/170, line 36, dwelling 174, family 174, Nebraska, Pawnee County. [S659] The Salina Journal, February 18, 1970, page 31, column 4. [S1543] Barbara Hettinger, "Ira DeWitt family," e-mail to Julia Langel, April 12, 2009, Ira DeWitt family. [S1890] Warren Farrington, "warren Farrington," e-mail to Julia Langel, March 5, 2011, warren Farrington.